If you’ve ever witnessed the finish line at a triathlon —especially a long distance triathlon race right before the seventeen hour cutoff — you were probably exposed to a wide range of raw human emotions. Once past the finish line, some athletes are in a state of euphoric jubilation, and others are crumbled in intense agony from putting their body through something that it was not necessarily meant to do. The long distance format of an Ironman consists of a 2.4- mile swim, 112-mile bike, and a 26.2-mile run. This event is not for the faint of heart. (Don’t worry: there are many races below these epic numbers for the beginner triathlete!). Spectating a race could cause you to catch the triathlon bug, envying the experiences of the athletes as you witness them finish the race in a heap of emotion. If you are moved to compete, jump in with two feet and start your journey! 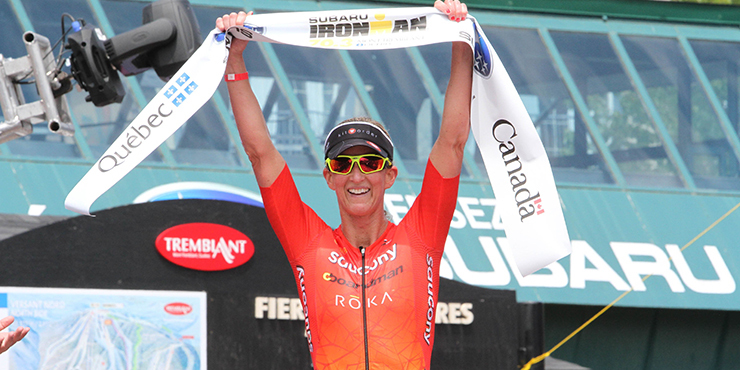 To help you on your path, we asked Meredith Kessler, eight-time Ironman champion who will be competing in her 55th full Ironman race at the Kona World Championships in October (and hoping to be the first American-born female athlete to win the title since 1985!​), to recommend five things first timers should know about doing triathlons. 1. Study weather conditions: Nothing can derail your race faster than a weather forecast you were not prepared for whether it is extremely hot, cold, rainy, or windy. Cold hands and body can lead to an early exit as well as not being prepared for the sun. You need to know the temperature of the water because if it is too hot, you will have to wear a skinsuit and if it is too cold, it will be a wetsuit legal swim. 2. Practice nutrition and hydration: One of the things that you tend to forget yet are imperative in a triathlon race is your fuel for the body and what you drink. This means carefully mapping out what you are going to eat in the days leading up to the race, the morning of the race, and during the event itself. You need to practice in your training with everything you are going to consume in order to prevent any potential GI issues. Whether it is Red Bull on the run or gels on the bike, make sure you are using them to simulate race like conditions in practice. 3. Transition 101: Transitions are daunting so it is marquee to keep it simple! Only take what you are absolutely going to use into transition so that going from the swim to the bike and bike to the run is a thoughtless and poetic process. As always, practice your transitions before the race. Take off your wetsuit, mount your bike, dismount your bike and put on your run gear; do this over and over again until you are efficient at it all. 4. Lists are your friend: Between the nerves and the anticipation, race week is organically a bit stressful no matter what! Try to avoid any unnecessary stress by being extra organized with a tidy list of everything you will need for the race weekend. Although you want to keep things as simple as possible, in triathlon, you are trying to get better at three distinct disciplines so there will understandably be a lot of gear, nutrition, clothes, etc…Prepare a list and double check it twice before heading out on your race adventure – even if a little tedious at first, it will become a routine! 5. Enjoy the day: Triathlon is a journey and you are constantly learning and evolving – EACH day, EVERY race. The race itself is a culmination of all your hard work, dedication and gumption to reach that pivotal point. Training and preparation breeds confidence and calmness. To be human is to have butterflies though if you have put in the time and the effort, you should be very chi and at ease. Put all of the waves that you have experienced on the journey in your back pocket and as fuel to the finish line! The highs and lows in one race are immense and this – PRECISELY – is the challenge that drives us triathletes to try to conquer! Previous postWriter, Runner … Triathlete? Next postORGANIC MILK LASTS SO MUCH LONGER THAN REGULAR MILK. WHY IS THAT?